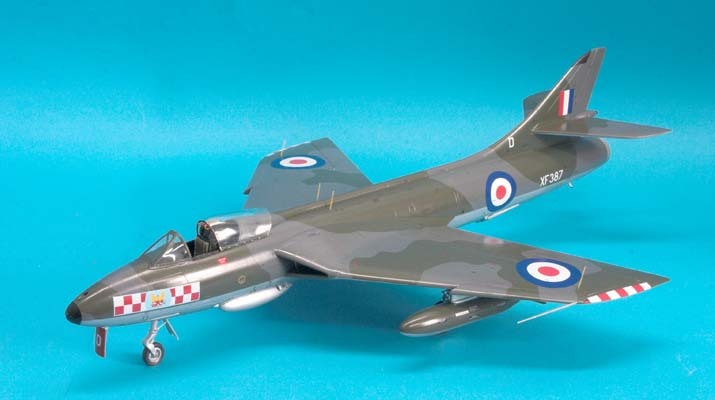 Revell pulls it off again this time with a step backwards in time, not quality I must add, back to the Hunter Mk.6 from the Mk.9 kit which was released in 1998. 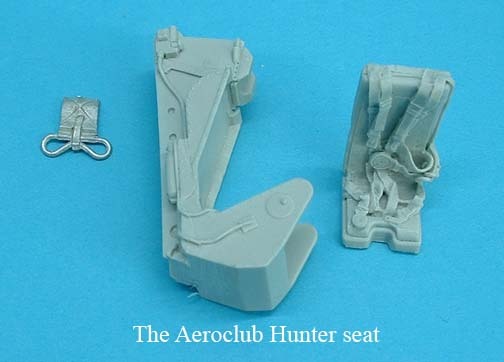 A new frame now carries parts to make the earlier Martin Baker Mk2 seat pan, the smaller tailpipe without the parabrake fairing but with sidewinder missiles plus launch rails for the Dutch version that is included on the decal sheet. 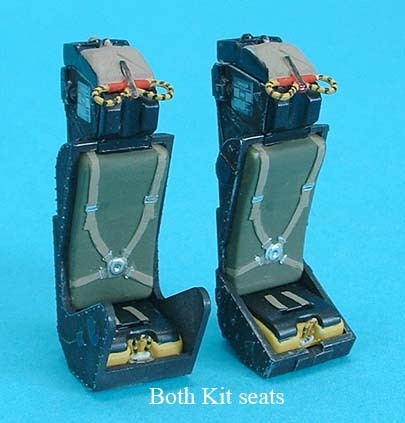 Along with these you get a set of full area flaps to be used with the smaller 100 gallon tanks carried by the Mk.6s. 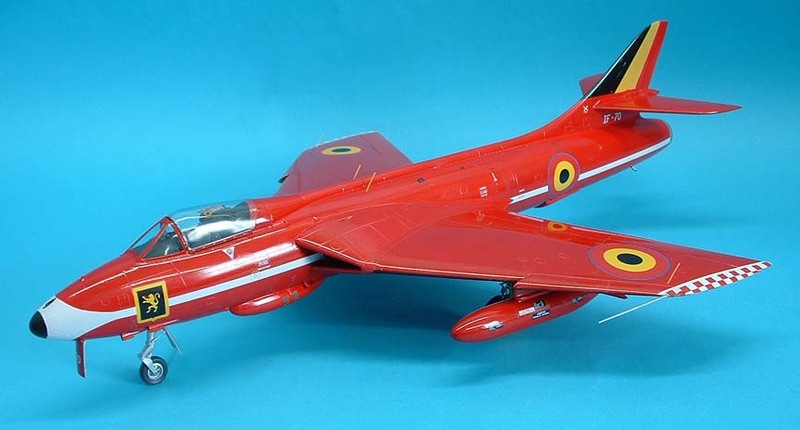 The decal sheet has markings for Five aircraft, two RAF squadrons No92 and No56, two Dutch squadrons, No 324 and 325, plus a Belgian air force machine from 22 squadron. 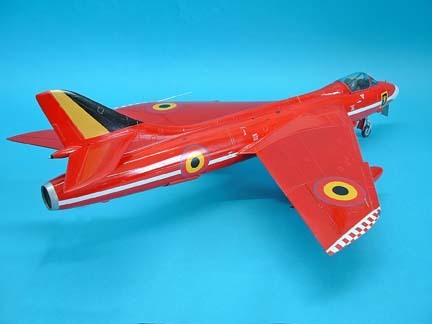 The sheet is huge and contains heaps of stencils and code letters, I liked the way the Belgian underwing codes were “cut” to match the wheel bay doors but wondered why the RAF ones were not. 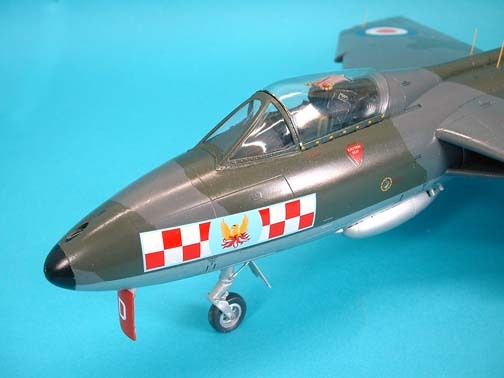 A number of items are wrongly noted on the instruction sheet ie, two decals on the seats are numbered 161/162 but the sheet only has numbers up to 160, it should read 155/156 and while any pilot likes to know how his fuel reserves are I am sure he doesn’t need the decal 157, with filling instructions for the wing tanks, on the instrument panel. I also noted that the roundel blue used on this sheet is too light, should be a lot darker. 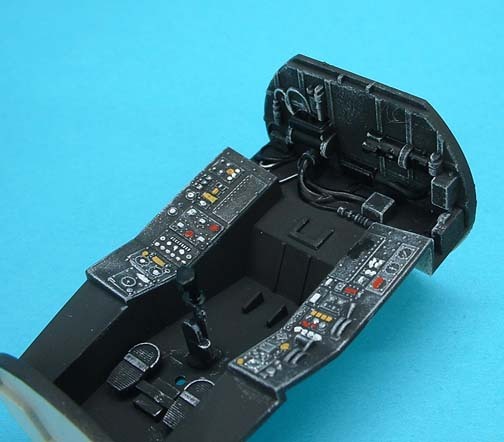 Surface detailing is neatly done with scribed panel lines and rivets etc the cockpit bath is improved over the Mk 9 version with more details but the interior of the fuselage walls has no detail at all in this area, crying out for after market sets from someone. 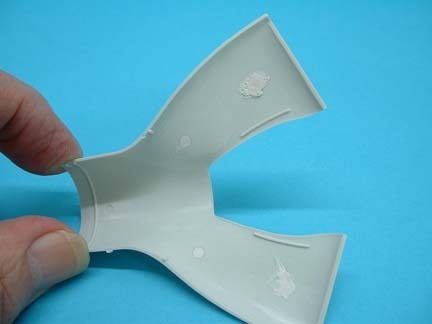 The fit of the parts for the most are excellent but I had to use a small amount of filler in a couple of places. 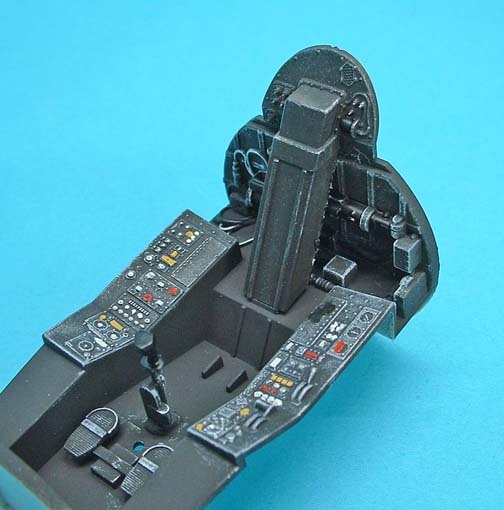 The cockpit / front fuselage were all painted with a very dark grey then details were picked out in various blacks the instrument panel was dry brushed with a tiny drop of white for the gauges and some aluminium for wear and tear areas this not only makes it look used but brings out the details much better. 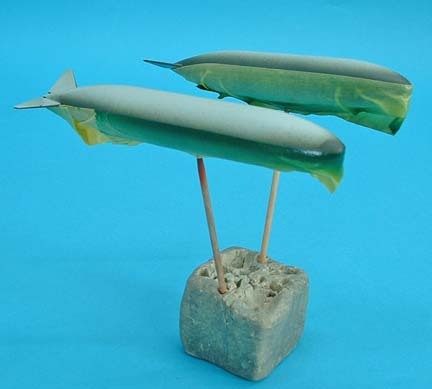 <> Step 7 was made up minus the nose leg but not added until 40gms of lead shot was poured into the nose cone and the front of the fuselage and sealed in with epoxy resin checking that the weights didn’t interfere with the wheel bay. I dislike putting the nose leg in this early in the construction so it can be modified by cutting off one of the side pins and left until later when with a little wiggling it can be placed nicely. 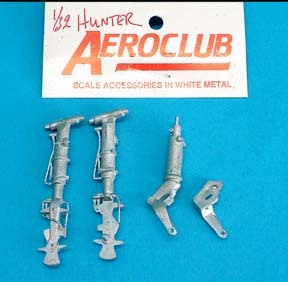 I had a choice here as we had two samples of Metal undercarriage legs in for review from Aeroclub @ £2.08p and Scale Aircraft Conversions @ $18.95, the Aeroclub legs have the Hydraulic lines moulded on while the SAC ones don’t but they supply soft wire to make your own. 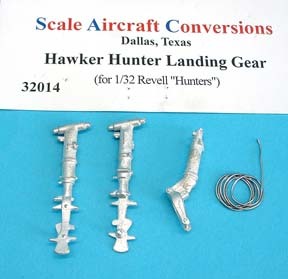 These metal nose legs can be wriggled into position without cutting off the side pin. Step 8 The coaming and gunsight were left off until all the cleaning up of joins was complete then the clear part 20A was replaced with a sheet of clear plasticard. Step 10.11 The air intake trunking has some ejector pin marks which will need filler. When you build the air intake trunking I would suggest that you only glue parts 28 & 29 by the rear end only to step 9 as these plates need to be flexible to slip around the end of the front fuselage assembly. You can eventually cement the tops and bottoms of the plates when finally in position at step 13. 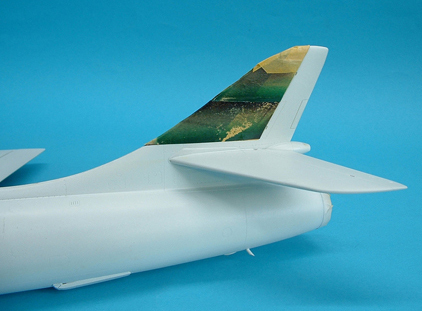 Steps 16.17 If you are adding the flaps in the closed position then it is OK to add them here but if you want them deployed add them much later after the undercarriage is installed. 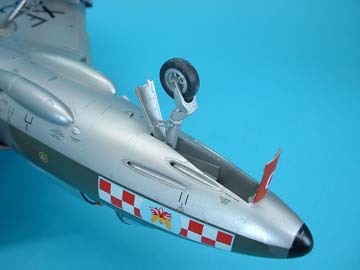 Pay particular attention to the wing leading edge extensions and the wing tips, try to get all joins level with the wing surface, I found I needed a little filler here, also the wing tip lights (clear parts 39.46) will need sanding down as they are too thick but remember to polish them back again afterwards before colouring with Tamiya clear paints. Step 24 I have used the Aeroclub nose wheel leg which has holes for an axle to mount the wheel so I had to drill through the centre of the wheel to accommodate it. Step 43 The fins on the 100 gallon tanks should slope downwards when assembled but the instructions have the numbers in the wrong positions, just swap them over. Step 46 The tank Pylons are from the original kit and were meant for the outer wing positions but here they are used on the inner position, unfortunately the locating pegs don’t match the holes there. 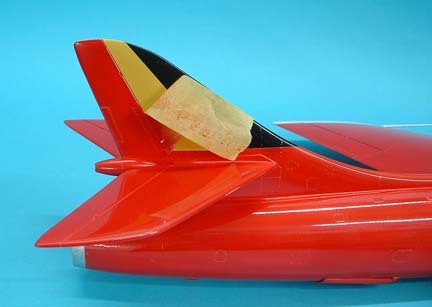 You have two alternatives either slice off the rear peg or drill a new tiny hole in the wing towards the rear to match the pegs; I did the latter to maintain the line of flight. 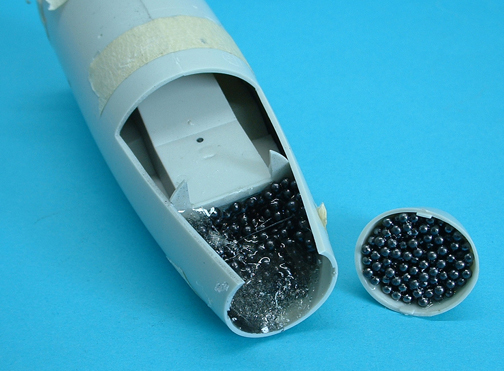 Filler is recommended to fill the outer pylon holes but I find it easier to drill the holes to 1mm size and place a length of 1mm rod in position and cut off at the surface when hardened. Nearly all the construction work is now done so my model was washed in warm soapy water to remove any finger grease from handling during construction and left overnight to dry off. Before proceeding, the windscreen was cemented into position and masked up using Tamiya tape the canopy also was masked but this was only tacked in position with some PVA glue, it can easily be opened after painting and the remains of the glue cleared away for a smooth operating canopy. Using a HB pencil the top camouflage was marked out and I sprayed Humbrol Hu 164 dark sea grey on just covering the pencil marks by a couple of mm this was then left overnight to harden off. I tried a different method to get a sharp edge to the second colour, the grey was overlaid with Tamiya’s wide tape and I used a new scalpel blade to very lightly cut around the edges of the grey which was visible through the tape then the green Hu 163 was lightly dusted on in a couple of coats so as not to build up a ridge at the edge of the tape, both colours were extended well below the fuselage demarcation line to ensure there were no gaps later. 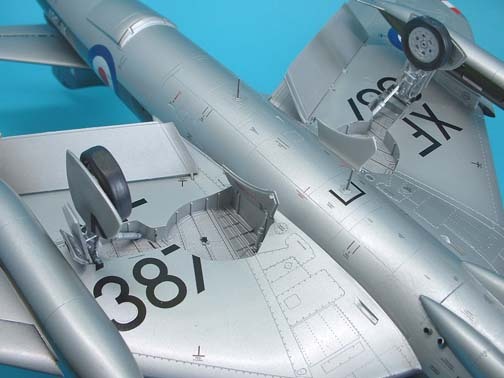 The fuselage and leading edges of the wings were masked for the lower colour and here the real aircraft is not bare metal but painted silver so I used Hu 191 silver gloss which is an extremely fine pigment silver and looks fairly authentic for the real thing. The same three colour paints are also available in the Xtracolor range X01 green, X04 dark sea grey and X38 high speed silver. When all the masking was removed I found that cutting the masking tape in situ had left some tiny cut marks in the plastic of the top surfaces, no good of trying to rub them down as the paint would go first, answer, a few coats of Klear (Future) to get the shiny finish required for the decals leave overnight then a light rub over with worn 1200 grade wet and dry brought everything back to level, I won’t try that method again in a hurry! 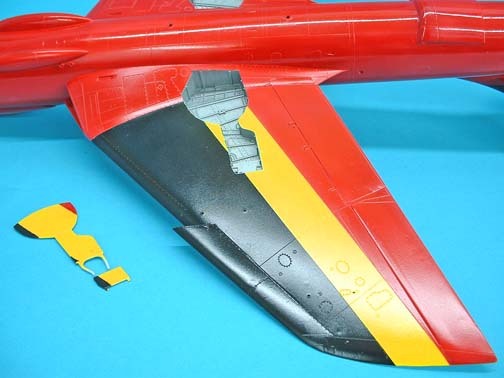 My first job on the decals was to cut the underwing serials to match the wheel bays I used a diagram I made when I did the Mk 9 Hunter, it needs to be drawn onto tracing paper the decal letters can be laid beneath it and cut where the lines intersect. After these and the main items are positioned the tiny stencils will take a few evenings to place and I found these liable to “silver”, to overcome the problem I placed 3 or4 items then I used a small brush to spread a tiny drop of Klear under each, just the tip of the brush is needed as we don’t want to get ridges when it dries. This takes a few hours more but it cures all silvering problems, all that remained to do now was a couple of fine coats of Klear sprayed on and you will have a nice almost glossy finish, It will be your choice as to how matte you want and use your particular method. 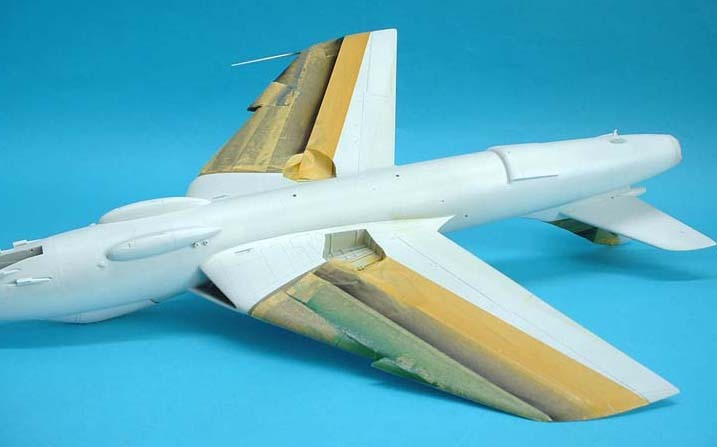 Now is the time to add the wheels, doors, aerials and last of all the Pitot tube remembering to keep it in the line of flight and not in line with the wing tip. 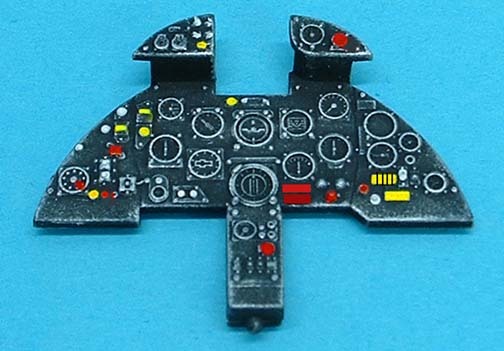 I had two samples of the kit this time and it gave me a chance to do a somewhat brighter finish for a change I also had a sheet of Daco decals for the Diablo rouge display team from the Belgian airforce. 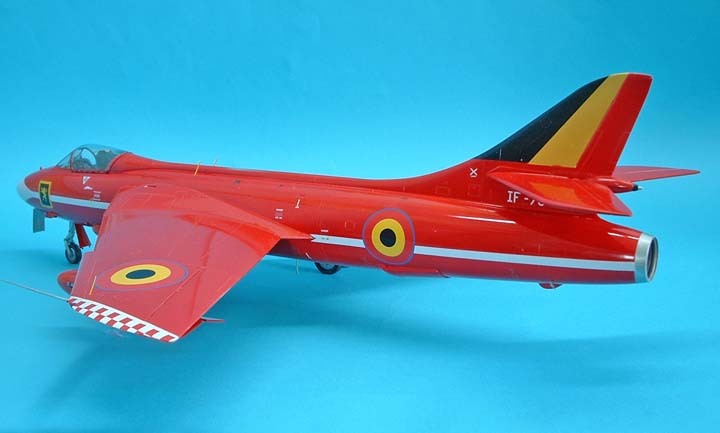 A bright red finish was on order here with some black and yellow national colour areas, construction was the same but the whole model was painted with Hu 130 satin white to give a good base colour for the yellow and red. 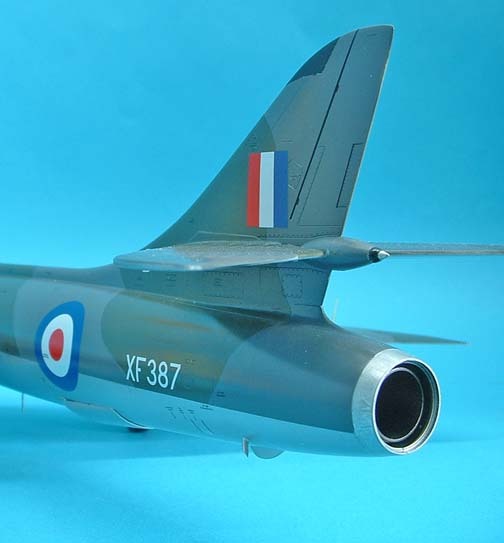 All in all Revell have given us an excellent model of a popular important British aeroplane.